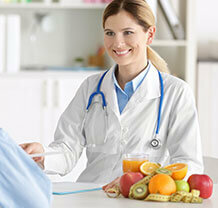 Diet and Nutrition | Emirates Hospital Jumeirah UAE. The Department of Nutrition and Dietetics at Emirates Hospital, Jumeirah, comprises of professionals who are well-trained and equipped with the required expertise in understanding the role of food to support your healing process. We provide a range of dietetic and nutritional services in Dubai, encouraging proper nutritional standards and practices. Our highly-qualified and experienced clinical dietitian in Dubai counsels’ patients after carefully assessing their nutritional status and provides advice based on their medical conditions. We offer nutrition and dietetics consultation for both adults and children in Dubai and help patients make healthy food choices.